My favourite spring food is fresh veggies on the BBQ. Once the snow melts and I can open the deck door and get to the BBQ again – that’s the best sign of spring for me! My husband loves asparagus, so as it comes into season he loves to grill it on the BBQ, he could have it every night. Hum, veggies on the BBQ is great! But I have to say that every year, after holding off during the winter, I can’t wait to have fresh, thin asparagus! My favorite spring food would be asparagus. I like them roasted, or cut up in salads, or steamed. So so good. First greens of spring! Yes, I’m fond of fiddle heads and ramps, but it’s the first peppery greens of the season that I adore after a long winter of root vegetables and watery lettuce. My favourite food of spring is definitely strawberries! I have a favourite Spring drink! For me there’s nothing quite like sipping on a Ceaser in the sun when it starts to get warm. My favourite food of spring is asparagus!! Great giveaway, thanks! I love rhubarb, especially if you throw it in with some strawberries and make a crumble. I used to live in Victoria and Rebar was my fave restaurant! Would love to have their cookbook! The spring treat I’m most looking forward to is strawberries. Love them in a spinach salad. I have to agree with most of the folks on here… fresh local asparagus can’t be beat! I don’t have a grill, so I just saute it with a little olive oil and balsamic vinegar — amazing! I don’t have a specific spring food that I gravitate to but I really like doing a detox in the spring and so I like to have fairly microbiotic, fresh and simple foods at that time. Asparagus – I hated it as a kid but can’t get enough now! 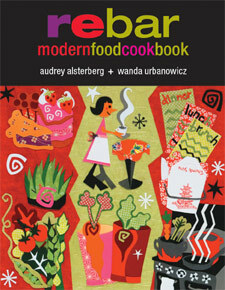 This is one of my favorite cookbook (don’t enter me in the contest). We moved, last summer, from Vancouver Island. I had the chance to eat at their restaurant in Victoria and it was a great experience. We use it about once every two weeks. My favourites-carrot cake, monk’s curry and the pumpkin muffins.